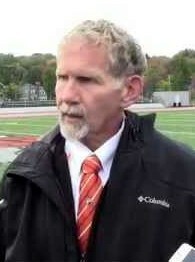 Newton North’s “Coach Cap” Peter Capodiluo, who is retiring at the end of this season, will be honored at the Rotary Clubs of Newton & Brookline 30th Annual Football Luncheon on Tuesday, November 25, 2014 at noon at the Braeburn Country Club. Boston Globe sportwriter Dan Shaughnessy will give the keynote address. The luncheon, which began in 1984 and brings together Thanksgiving football “rivals”, is a time honored tradition attended by coaches, players and educators from both the Newton and Brookline school systems, along with many elected officials and other dignitaries and community leaders. All are welcome to attend! To help honor Coach Cap, community members are invited attend the luncheon and also to write personal tribute messages which will appear in the luncheon program book. By purchasing a “tribute”, we will include your message in the program book and make a donation to the charity of Coach Cap’s choice. To purchase luncheon tickets and/or to include your special message to Coach Cap, please visit our Eventbrite page at http:bit.ly/1y11NUJ. Rotary brings together a global network of volunteer leaders dedicated to tackling the world’s most pressing humanitarian challenges. Rotary connects 1.2 million members of more than 34,000 Rotary clubs in over 200 countries and geographical areas. Their work impacts lives at both the local and international levels, from helping families in need in their own communities to working toward a polio-free world. For more information, visit RotaryNewton.org.